HMS Victory is famous world wide as Admiral Nelson's flagship at the battle of Trafalgar in 1805. Her keel was laid in 1759, she entered service in 1765 and saw fierce service over the next 47 years. Her Captain at the time of Trafalgar, Thomas Hardy, later became the First Sea Lord and legend has it rescinded his orders to scrap Victory after the news upset his wife. Victory then lay as a hulk until 1922, deteriorating badly before a committee was set up to restore her and she was moved to her current home in No2 drydock, Portsmouth. Since then, a continual program of repair and restoration (and the good luck to survive the devastation of Portsmouth during WWII) has seen her become a tourist icon, as well as active service as flagship of the Second Sea Lord, Commander in Chief of the Royal Navy's home command. 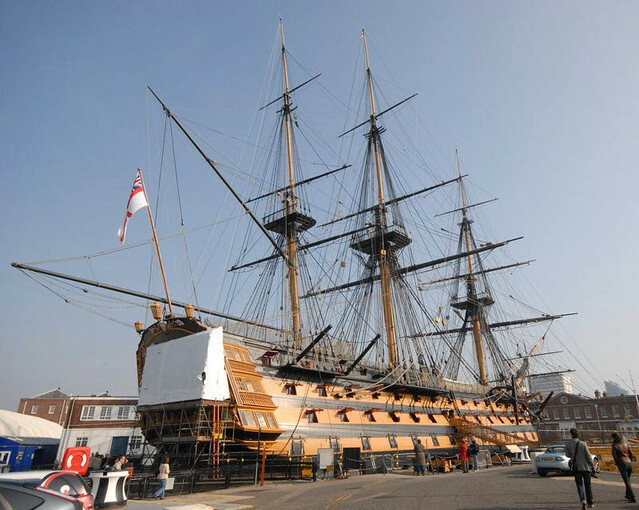 One of the star attractions of the Historic Dockyard in Portsmouth, she attracts upwards of 350,000 visitors a year. Her masts tower some 62m above the dockside and although she is dwarfed by the modern Navy vessels she neighbours, her 3,500 tonnes of oak hull and 100 cannon remain a powerful reminder of the might of the sail powered Navy. Due to the popularity of the Victory, it was requested that we perform the survey outside of visiting times. 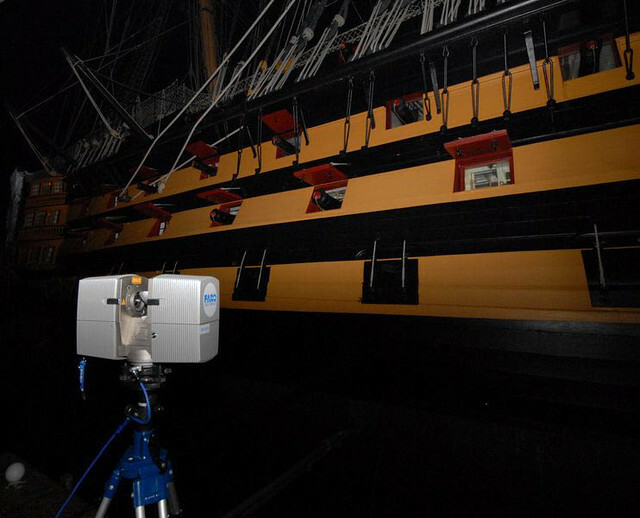 As laser scanning doesn't require daylight, GSS/DJA started work at 5.30pm, working in the dark through the night to 3.45am, capturing some 17 high resolution scans to ensure that all detail of the black painted hull was recorded. Each scan was located using a total station to a control network of targets and tied in to the overall control for the vessel, ensuring that our recorded data was aligned to the existing data for the hull. All work was carried out to a detailed method statement, complying with the health and safety requirements of BVT Fleet Support and a working shipyard. On return to our offices, the scan data was processed using FARO Scene, compiling both the long range and shorter range data with the total station data. Filtering and cleaning tools ensured that only the required data was left in the point model prior to further processing. 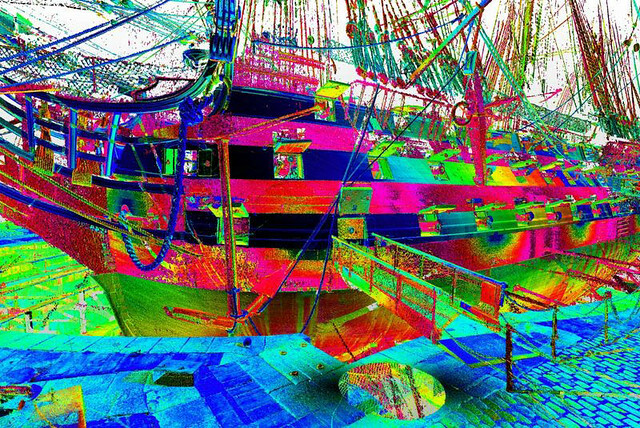 The processed files were exported to Pointools and used as the foundation for creation of accurate elevations of the Port and Starboard hull sides, using a mix of CAD packages to extract details such as planking butts, iron eyes and rigging straps, as well as 3D coordinates for over 430 key points on the hull sides. This record will allow accurate reconstruction and relocation of any fittings or planking, giving fast checking of refitted components. This video shows a fly around of the data captured, for further images, please visit our Flickr gallery.